U.S. Manufacturing: A Remembrance And A Look Ahead A century ago, U.S. manufacturers were building a mountain of wealth that unskilled workers could climb. Today, economists see U.S. factories flourishing but say workers will see fewer opportunities. 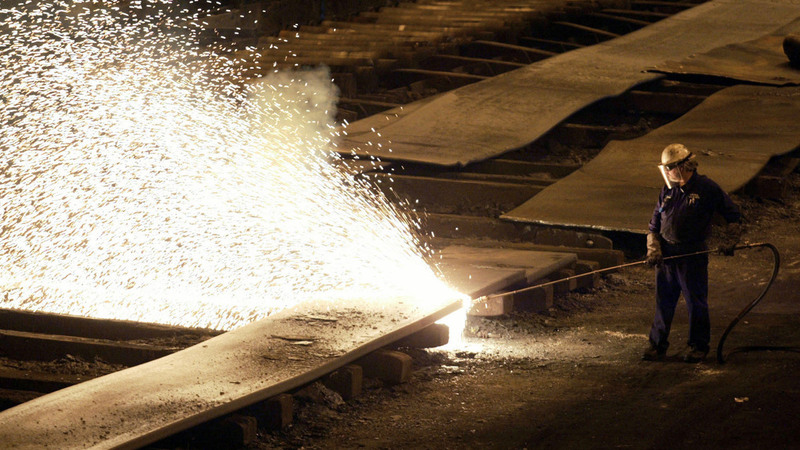 A worker cuts slabs of steel at a mill in Cleveland in 2004. If it weren't for American manufacturing, I wouldn't be here today. A century ago, my grandfather moved from Poland to Youngstown, Ohio, to work in a steel mill. At the time, Ohio factories were cranking out steel slabs, tires and cars — building a mountain of wealth that the next generation could climb. And the generation after that. But what will happen in the 21st century? Is the path that led to higher ground blocked now? That's because, on the one hand, U.S. manufacturing is booming. Customers everywhere want our aircraft, electrical equipment, engines, metal products, chemicals and much more. So in dollar terms, output is at record levels — worth more than $2 trillion. Back in 1964, remembered as a glorious time in our industrial history, factories generated only about $1.3 trillion in inflation-adjusted dollars. Only two other rivals can play in the $2 trillion ballpark: China, which has about four times as many people, and the entire European Union, with more than a half-billion people in 28 countries. Still, Americans worry. They have seen factory jobs disappear at a breathtaking pace. In 1979, nearly 20 million Americans made goods for a living. Today, only about 12 million are still standing on factory floors. As a portion of the economy, manufacturing has shriveled. When my parents got married in 1952, manufacturing made up nearly 28 percent of the economy. Now, it's about 12 percent. And the U.S. manufacturing position in the world has shifted dramatically. The U.S. share of global manufacturing has dropped from about 30 percent in the early 1980s to just about 17 percent today, according to a Congressional Research Service report. So we wonder: What is the long-term outlook? To find answers, NPR will be visiting factories and talking to experts over the next several weeks. The series, called American Made: The New Manufacturing Landscape, kicked off this week when NPR's David Greene reported on his visit to Rochester, N.Y.
And Friday is National Manufacturing Day, an annual celebration backed by trade groups. They have scheduled about 1,500 events, such as factory tours and equipment demonstrations. Manufacturing output has grown more rapidly in this country than in Europe or Japan during the past decade. But China and South Korea have been outpacing us in growth. Factory wages are still good here, at about $27 an hour. But workers earn more in some other advanced countries, including Germany, Canada, France and Japan. In the United States, development dollars mostly go into advanced sectors, like electronic instruments and pharmaceuticals. In other countries, the R&D focus is on more mundane sectors, such as machinery and motor vehicles. Energy. The shale-gas revolution has cut natural gas prices by two-thirds since 2008. That cost advantage is making U.S. manufacturing far more competitive. Technology. Wireless intelligence and data analytics are giving manufacturers better control over production. Additive manufacturing. In the past, manufacturing involved a lot of cutting and grinding, wasting both materials and energy. With an additive process, manufacturers can layer on materials to build goods, leaving little waste. The bad news for workers is that virtually everyone expects more of them to be replaced by equipment and software. Former Treasury Secretary Lawrence Summers summed up the consensus view in a recent essay, saying: "There are good reasons to expect an uptick in the next few years in manufacturing employment. But the long-term trend is inexorable ... technology is allowing the production of far more output with far fewer people." I grew up surrounded by mills, mines and factories. I have covered manufacturing for decades, and I must agree with Summers. I know that if a poorly educated person like my grandfather showed up at a steel mill today, he wouldn't get a foot in the door. Modern mills need metallurgists, electrical engineers and quality-control managers — not laborers. For workers with the right skills, the economic ladder at a steel mill reaches higher than ever, up into an impressive, whirling workplace where computers, robots and automated equipment create wealth. But the lowest rungs have been sawed off. And finding ways to make sure families like mine can still rise up will be the greatest economic challenge of the 21st century.